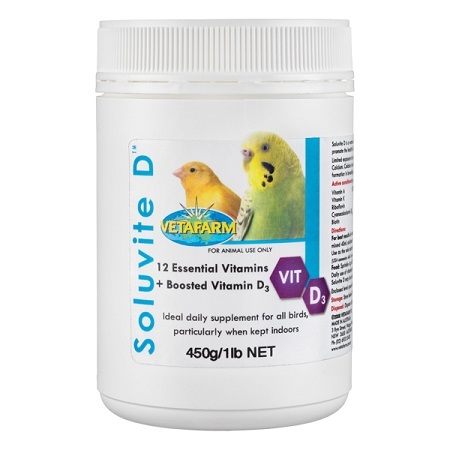 Soluvite D is a water-soluble formula that provides additional Vitamin D3, as well as essential vitamins to promote the health of birds housed indoors. Limited exposure to sunlight may result in Vitamin D deficiency. Vitamin D has a role in the absorption of Calcium. Calcium is essential for normal growth of healthy bones in young birds and for normal eggshell formation in breeding hens. Soluvite D should be used in conjunction with a calcium supplement, Calcivet or D'Nutrical for birds on seed diets to ensure balanced nutrition. Contains all 13 essential vitamins required for a balanced diet in birds along with increased levels of Vitamin D3 to support birds with insufficient access to natural sunlight. Vitamin D3 is a particularly important nutrient. Birds housed indoors may lack D3, which can lead to poor breeding success and chick growth, inadequate calcium absorption and many other problems.